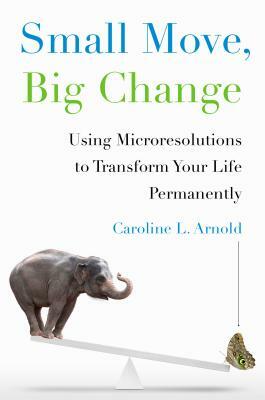 "Small Move, Big Change "is Arnold's guide to turning broad personal goals into meaningful and discrete behavioral changes that lead to permanent improvement. A microresolution is easily kept and designed to nail a self-improvement target exactly and deliver benefits immediately. While the traditional resolution promises rewards on a distant someday, a microresolution rewards us today by instantly altering our routines and, ultimately, ourselves. Caroline Arnoldhas been a technology leader on Wall Street for more than a decade, managing some of the financial industry's most complex and visible assignments. She received the Wall Street & Technology Award for Innovation for building the auction system for the Google IPO, and her name appears on technology patents pending. She now serves as a managing director at a leading Wall Street investment bank. Arnold grew up in the San Franciso Bay Area and graduated from the University of California Berkeley with a degree in English literature. She lives in New York City with her husband and daughter.